"The buyers are very well prepared, the expectations of both buyers and sellers are very close already and this will unleash the delay in the realization of some overvalued projects," Stoykova says. According to her, 2019 will be the year when the real prices of the properties will be applied which will lead to vendors and buyers willing to make a reasonable deal. "I think the year will be very favorable both for sellers who will be able to sell their properties at sufficiently high prices in comparison with previous years and for buyers because they will have a choice - new or old construction, projects in an advanced phase of realization, properties "on green", added Stoykova. Stoykova does not foresee a drop in prices, but there will be no growth as well, the market and the economy as a whole will remain at a steady level. "The expectations for this year, albeit slightly downsized, are relatively similar to the past. I even think there will be surprises in that direction. From the first few months, we see that 2019 is moving more positively than last year. Our company reached a record in terms of volumes of transactions in February. People who have made a request as early as 2016, at the start of the first new build projects in the current cycle, are now buying, i.e. they have looked at different projects, the property they liked is probably already in advanced construction and now they make a purchase decision. We see many examples of people who either have been searching for a long time or are asking and buying right away, especially for projects where prices are good - between 850 and 950 Euro per square meter," says Stoykova. Her expectations based on sales from the beginning of the year are the volume of transactions to grow thanks to the strong supply of new construction, although this may be reflected later in the statistics due to the delay of the listing of properties purchased "off-plan". "Last year, in the first quarter reports, I predicted a market slowdown, because all indicators started to grow at a slower pace, and that, along with the entry of a number of new regulations like the GDPR, made me think that the year would be difficult. We are still talking about what happened last year and that is why the news are dominated by titles for the slowing down and the minor moods, and 2019 is already running at a different speed," says Stoykova. 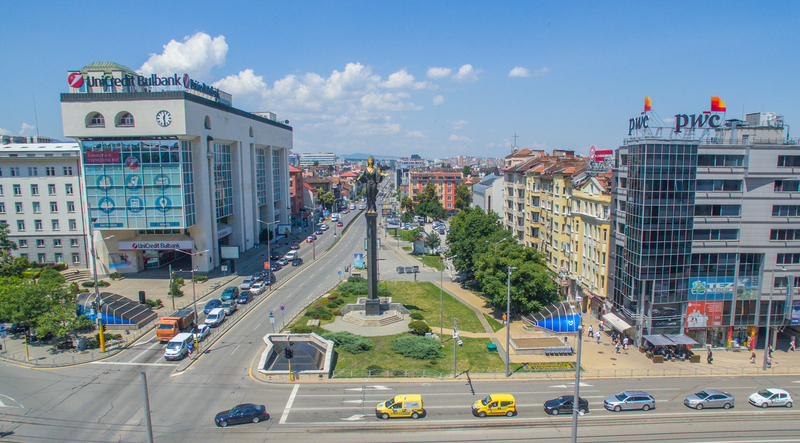 The increased supply mainly due to the new construction is the reason for the slowdown in the price growth in Sofia, with BULGARIAN PROPERTIES data showing that prices have risen by 4% in 2018 compared to the registered increase of 16% in 2017. "We only managed to return to the 2007 and 2008 levels by the issued building permissions indicator, the rest of the indicators did not reach the peak of ten years ago - neither the average prices in Sofia and the other cities, nor the lending as a share of the gross domestic product. In 2008, we accrued more than 6% of newly granted credits to GDP, while we are now at about 3%, that is, twice as low, so the market foundation is much better" says Stoykova. She believes that last year's Bulgarian National Bank warnings for banks to be more cautious in lending were justified. "We must not forget that banks are commercial companies and the regulator has intervened quite right to avoid something that could have happened without a specific situation. If I'm not mistaken, in 2006 BNB imposed limits on lending, i.e. the regulator then intervened to prevent over-crediting, but at that time there was a tide of investment from abroad, and even if that mechanism had worked, it could have not neutralized the effect of the balloon that was inflating around the world" says Stoykova. According to her, the BNB's warnings have actually led to greater prudence from banks and stricter compliance. "Lending grew last year by 6-7%, while in the previous year we had 38% increase in new loans, including refinancing," Stoykova notes. However, she adds that there are always dangers, because despite the more tight regulations at present, both in Europe and in Bulgaria, not everything can be fully regulated before a specific problem is identified. "However, the newly-released loans are moving very sensitively compared to the background of the real sector, and interest rates have never been at such low levels, and even if there is an increase in the future, although the indications are delayed, it will be smooth, "says Stoykova. In the other large cities outside the capital, the year for the residential property market is starting weaker. In Plovdiv, the particularly high price rises of 14% last year have cooled the lust for purchases and people are waiting for the pass away of the effect of the European Capital of Culture event, which further increases the cost of the properties, says Stoykova. "At present, the city seems to have too much supply of very large projects, and prices have reached levels of 700-750 Euro per square meter and are clearly approaching the upper limit of their rise. As a result, there is now active construction in Plovdiv, but buyers seem to be slightly absent. I suppose this effect will be gone, as we also saw something similar in Sofia at the beginning of last year, when we held the presidency of the European Union. Then there was a surplus of rental yields, but they did not stay long" Stoykova notes. Varna, which last year was the champion of deals in the country, remains a very active market as it catches some lag behind Sofia and Plovdiv. In the sphere of holiday homes, the recent years trend is to have fewer deals in the active winter season and more outside the season. Therefore, the demand for ski resort properties is currently weaker, but Stoykova expects it to resume in the spring. "Interestingly, January started with a keen interest in the sea and more specifically at the South Black Sea coast, where deals are currently being made and property viewings are being organized. People who want to own a summer property know that they need to get it in the winter, so that the deal is closed and everything is ready for May when the active season starts, so the seaside region is currently interesting and active” she notes. The Bulgarians continue to dominate among the buyers, preferring mainly the southern resorts - Sozopol, Chernomorets, Lozenets and Varna to the north, because of the low prices and the foreigners are concentrated mainly in the Sunny Beach area. "Interest is coming back and many Bulgarians are already combining a holiday abroad and in Bulgaria, or they choose their country for their summer break, so that will surely move the market. Besides, hotel services have one of the biggest price rises that contribute to inflation, and people prefer to have their own holiday property instead of depending on bookings” says Stoykova. According to her, it is possible, after clarifying whether and how Britain will leave the European Union, to witness an unleash of the foreign interest in holiday properties in Bulgaria because the Brits continue to observe the market. "We also see the Irish becoming very active because their country's economy has clearly improved. Years ago, along with the Britons, they were the most active group of foreign buyers. We also have inquiries from Americans, but they are unlikely to turn into a big wave. Their interest is concentrated mainly around Veliko Tarnovo because of the rich culture and history" says Stoykova. Recently, buyers from neighboring countries are also active and, according to her, Bulgaria may become a center where Serbs, Macedonians and Romanians can find a place for tourism and for their own home as prices in our country are affordable for them. Last year, BULGARIAN PROPERTIES celebrated its 15th anniversary, and Polina Stoykova is part of the company from the beginning, being its Executive Director for the past ten years. Last week, the company was honored by Imoti.net for Real Estate Agency of the Year, and Magdalena Tosheva, who is part of the BULGARIAN PROPERTIES team for ten years, received the award in the category Real Estate Broker. See more about the awards here. "We started during the previous property boom, so we are already in a second cycle of the real estate market. Everything that happened over the years was different and never repetitive. We can not make a parallel with either the previous property boom or the market conditions at that time. We went through the big peak of 2008, the foreign demand, the big economic crisis for which I as a manager, and I suppose the other managers and owners of real estate companies, were not ready because it was too large. We have experienced a change of buyers - from Brits, Russians and Bulgarians - and we have come to today's challenges and opportunities related to the dominant local demand" says Stoykova. According to her, the market is currently working with one engine - the local demand, driven by bank loans and household incomes in Bulgaria. But there is no second engine of foreign interest. "This is both good and bad. On one hand, it prevents balloons, which is positive, but it is also bad because domestic demand has its limits and the market can not grow so fast and continue to work at high speed as if supported by foreign investments, "summarizes Stoykova.